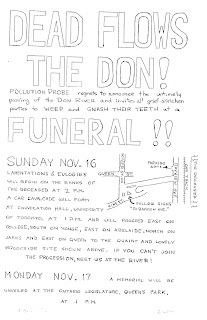 40 years ago today a group of students from the University of Toronto held a mock funeral for the Don River. Organized by the then nascent Pollution Probe, between 100-200 people gathered underneath the Bloor Street viaduct on the east bank of the river to lament the state of the river. intoned organizer Martin Daly. A woman dressed up as Lady Elizabeth Simcoe read exerpts from her diary which extolled the virtues of the Don as Toronto's main salmon stream. At the end of the service a wreath was tossed into the muddy waters of the river. 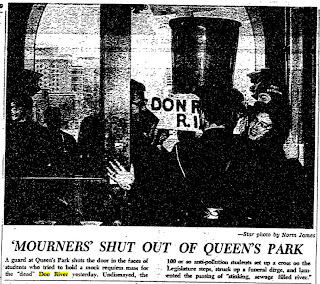 The next day another 100 or so people gathered on the steps of Queen's Park and sang a requiem mass for the "dead Don River". Oh, but the 1960s were great for colourful protests. So here we are 40 years later and I am trying to think of what has been accomplished to improve the state of the river. The bad news is that the river is still polluted and will likely remain so for the foreseeable future. In 2007, a provincial report listed the Don River as "Ontario's worst waterway". While the river's polluted state hasn't changed the nature of the pollution has. In 1969, eColi levels topped 61 million per 100 ml. These days those levels have been significantly reduced through a combination of sewage plant closures, a plan to capture sanitary sewer overflows, and a program to repair improper/illegal cross connections between sanitary and storm sewers. In the late 19th century, the lower Don was heavily industrialized and effluent dumped into the river caused pollution in the Ashbridges Marsh which eventually resulted in the marsh being filled in to create the Portlands. Subsequent neglect of this area has resulted in most of it being turned into an indutrial wasteland of abandoned brownfields, but I digress. The industry is long gone and so has its pollution. Today's pollution is mainly due to runoff from roads, parking lots, and other hard surfaces. Whenever it rains the water quickly runs into the storm sewers and into the river. On its way the water picks up sand, grit, oil, salt, and whatever other urban residues are lying around. The river which often takes on a muddy hue after a rainstorm reflects this urban runoff. Annual dredging of the Keating Channel at the mouth of the river where all this runoff is deposited amounts to 35,000 m3 of material! Solving this problem is no easy fix. The Don watershed is now over 80% urbanized and there's not much that can be done about that. The Don River flows through the world we live in. However the structure of our built environment can be modified. One such plan seeks to change how we design and build structures and also retrofit older buildings so that they have less of an impact on the watershed and the river. The TRCA has recently created the Don Watershed Plan which lays out planning and design methods that could lead to a better built city, one that has a lower impact on the environment. Implementing these methods requires changes in the way we think about development. While it may require more short term expenses, in the long term it will pay us back with a cleaner river. On the face of it, this 40th anniversary isn't much to talk about. The river is still polluted but in the interim people who care about the Don have put in place a framework which could lead to an environment which will allow the river to flow a lot cleaner than it has for sometime. Who knows, maybe the Don will one day again be known as Toronto's best place to fish. I just hope I don't have to wait another 40 years to see it happen. Posted by Donwatcher at 7:00 a.m.
Hey J. remember when Alex drank from the Don and got so sick Mum took him to Sick Kids and they removed his tonsils?